Trevor from Surly Bikes appeared in our bike shop on an otherwise ordinary Thursday afternoon. What was Trevor doing here in our little stembag of the world? He was here to Bikepack Against the Machine, of course. Did we? We did. What is Bikepacking Against the Machine? This is the third year of its existence, and traditionally we've loaded our bikes and more or less belayed each other up the face of a mountain for an entire day, and then moaned and lurched around a campsite in delirium and exhaustion for a subsequent day. This year we wanted to ride something a little more enjoyable and get a little deeper into the wilderness. Did we? We did. Before the bikepacking began, fortune was good and timing was right and a few of us had the chance to ride the Monarch Crest trail on Friday. We started around noon on a weekday and more or less had the trail to ourselves. As you may or may not know, the Monarch Crest trail offers some of the most incredibly scenic photo-ops that a person could possibly spoil by shoving their dumb ol' bike into. I was lucky to get this shot of my bike spoiling the scenery before all of these jokers moved in to photograph their own bikes. Incredibly, I'd recently ridden the Crest, and at that time I had suspected how charmed my life must be to get to do such grand things in such good company; to get to do the same thing again so soon made me feel a bit guilty. Um, not so guilty I wouldn't do it again tomorrow if I could, but still a little guilty. Nothing spoils an album cover like a bike helmet. We'd planned to shuttle ourselves, but ran into a small snag that led to hitching a ride with a stranger. If Nate looks like he laughing at his own little private joke, it's because he's hopped in the bed of a pickup with a disembodied dinosaur leg. It turned out that the stranger wasn't going our way after all, and after a brief moment in which I though we were going to be murdered, we were returned to our party unscathed and decided to drink beer until plan B found us. 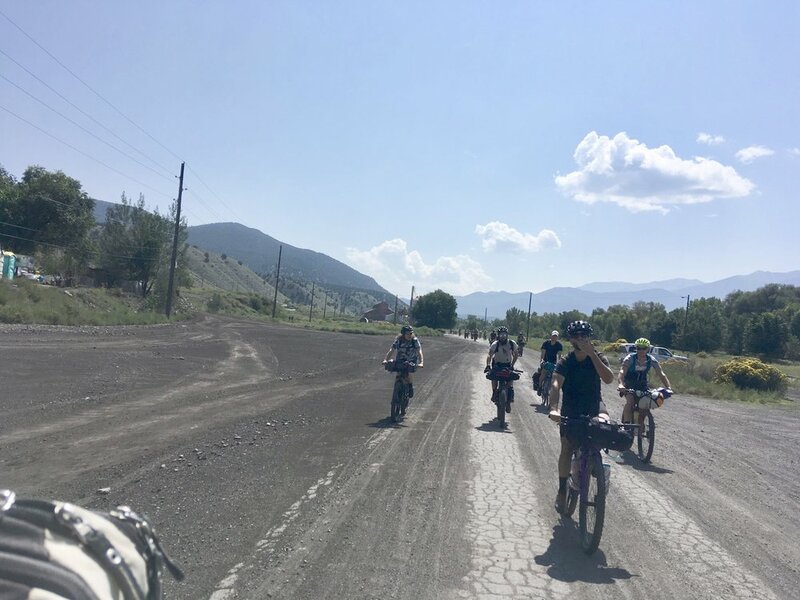 On Saturday morning, eighteen of us gathered in Salida with food for twenty-five, water for ten, whiskey for forty, and not a braze-on to spare. You can't fit much gear on a bike, but it sure does take a long time to pack your kit. We arrived in town at 10am with plans to meet at 11. By noon, some of us were ready. Does it matter that we got a late start? A wristwatch is a machine. Finally, in the heat of the day we rolled out. Our bikes were heavy. It was hot. Then it was hot and heavy and hard and steep all at once. I'm not really what I'd describe as a face-sweater, but sweat from my face I did--all over my Petite Pourteurhouse bag. Face-sweat tests prove the bag is waterproof, just like Surly says. After an hour of suffering, the grade mellowed out, the cloud cover provided relief, and people began conquering their hangovers. It could even be said that "fun" was a word that got thrown around. Only one of us dared drink of these mine tailings, and when he grew a second head we had to stop and debate whether our party had technically increased in number to nineteen and if it had, whether we were going to have enough whisky. The road gradually became steep yet again, and loose, too, and intersections not marked on our maps began to appear at regular intervals. This did not in the least deter us. It was quiet and pretty; this are things machines don't care about. We took a long rest here to regroup and to drink a few beers that had mysteriously opened. It was a pleasant rest, well-earned and essential, but we made the fatal error of believing we had neared the end of the climb. Beyond this quiet little meadow the road became increasingly steep, rocky, loose, mean, and unfairly vertical. Each time I exhaled a fine mist of face-sweat was vaporized and blown forth as though my mouth were the blowhole of a sea mammal. Such were the horrors of that road. But then we found ourselves in a place so scenic that I needed to photograph my bike. Campfires are good for letting the mind unspool. We enjoyed a bazillion stars and a vivid Milky Way until the moon rose and cast its glow upon us like the screen of a giant iPhone. There was fire breathing. There was an extensive cooking production with campfire rocks, plastic baggies, a tiny pot, and freeze-dried phó. Whisky bottles circulated. It's difficult to make an argument about why this is a better thing to do than watching television or scrolling through social media feeds; there isn't much utility in any of these activities. I do know that, around a campfire, when my hand robotically reaches for the phone in my pocket, I am happy to remember that I am in the middle of nowhere and the device is useless. I am free to focus my attention on whatever I like. The more surrounded one is by the machine, the more difficult it becomes to resist. If waking up here doesn't set you right, you might be a machine. Since we'd gained 3800 feet in 18 miles on day one, we left ourselves with 35 miles on day two. We set out on what promised to be an easier, more pleasant day. From the window of an airplane, cities resemble circuitboards. As our phone calls have become emails have become text messages have become emojis, our communication with one another more and more resembles a string of 1's and 0's. It's refreshing to step away from those habits, step away from cat videos, and watch a fire burn. There's something essential about doing an activity with other people, looking them in the eye, and passing around a beer. Which is exactly what Gary was trying to do when he dropped this PBR, which he'd lugged for 45 miles and 5500 feet of climbing. Thanks to all of you who came and made a couple of rotations on a hunk of rock into an incredible weekend. I can't think of another thing I'd have rather done. Thank you also to Surly Bikes for 1. making objects that we aren't conflicted about selling to friends who've become customers and customers who've become friends, and for 2. taking the time to come visit your pals in Denver. As long as there is a machine to bikepack against, consider your invitation open.